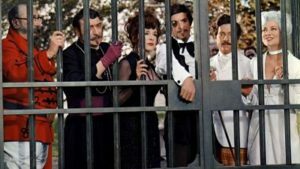 Director Philippe de Broca’s 1966 King of Hearts brought a modern 1960s sensibility to a story set during World War I, laid the groundwork for such dark war comedies as How I Won the War and M*A*S*H.
Scottish soldier Private Plumpick (Alan Bates, Women in Love) is sent on a mission to a village in the French countryside to disarm a bomb set by the retreating German army. Plumpick encounters a strange town occupied by the former residents of the local psychiatric hospital who escaped after the villagers deserted. Assuming roles like Bishop, Duke, Barber and Circus Ringmaster, they warmly accept the visitor as their “King of Hearts.” With his reconnaissance and bomb-defusing mission looming, Plumpick starts to prefer the acceptance of the insane locals over the insanity of the war raging outside. In the half-century since its premiere, King of Hearts has become a worldwide cult favorite and one of de Broca’s (The Oldest Profession) most memorable films. The cast also includes Geneviève Bujold (Earthquake), Michel Serrault (La Cage aux Folles) and Adolfo Celli (Thunderball) and the score is by the great Georges Delerue (Jules and Jim). Cohen’s deluxe disc package includes a remastered edition of the film along with a commentary track by film critic Wade Major, a new conversation between Geneviève Bujold and IndieWire’s Anne Thompson, a new interview with cinematographer Pierre Lhomme, the 2018 re-release trailer, and the French rerelease trailer.